With an Artsystems Pro art gallery, artist, or art collection website, you can control and immediately update your site on your own at any time. 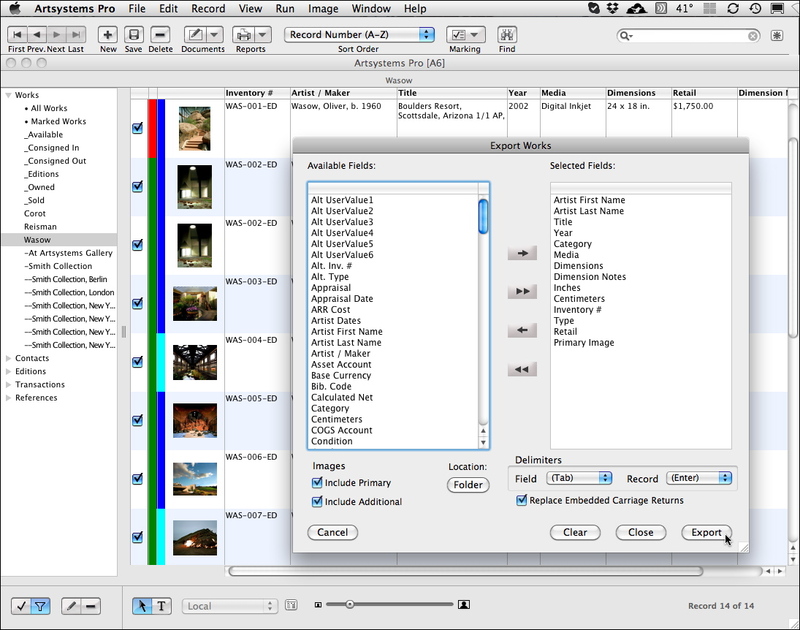 Just select work and exhibition information already entered in Artsystems Pro or StudioPro database software, and post. Don’t have Artsystems software? 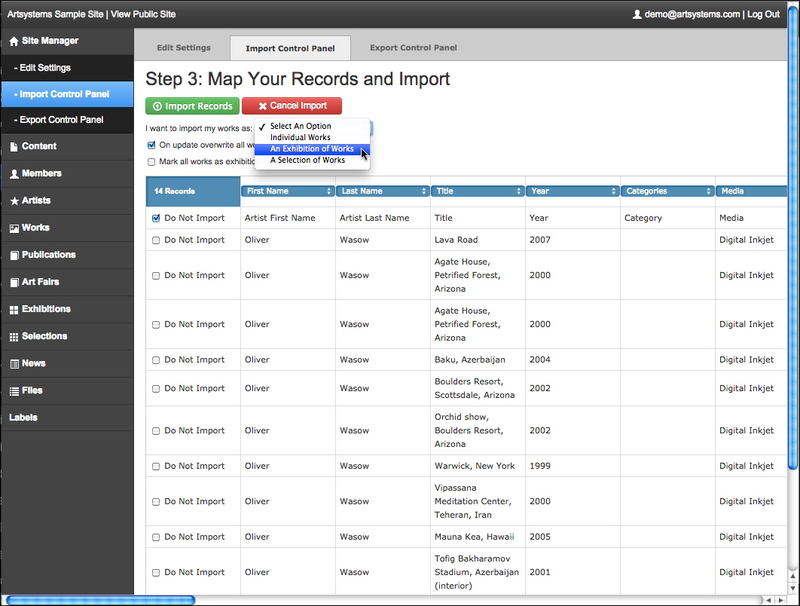 Add information and images directly into the online content management system or even update with works exported from any art management database via our bulk upload tool. Artsystems mobile-friendly responsive-design websites automatically change the size and configuration of elements to display best on any size device, including mobile phones, tablets, and desktop browsers. Google has now stated they rank responsive sites higher than their non-responsive counterparts. 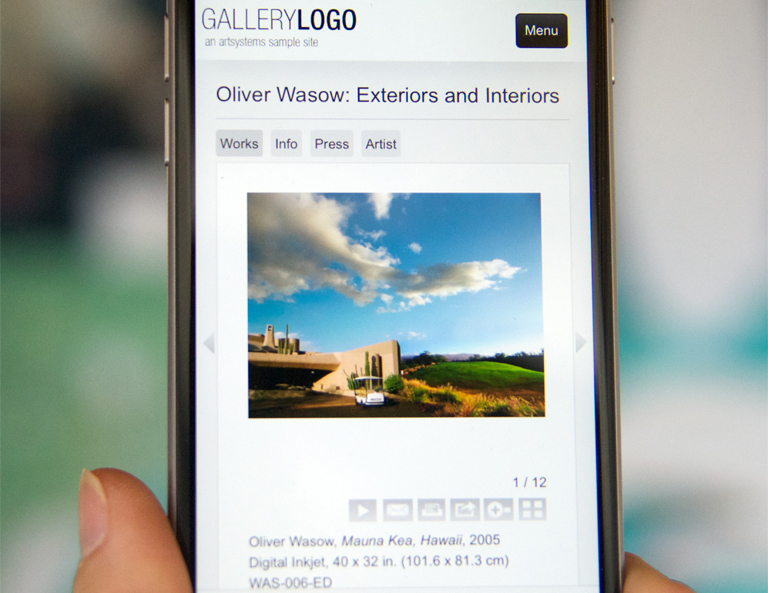 As up to 50% of new visits come on a mobile device, an upgrade to a responsive site makes sense — compare a non-responsive gallery site to one of our new site template themes, Standard, Touchstone, or Criterion. 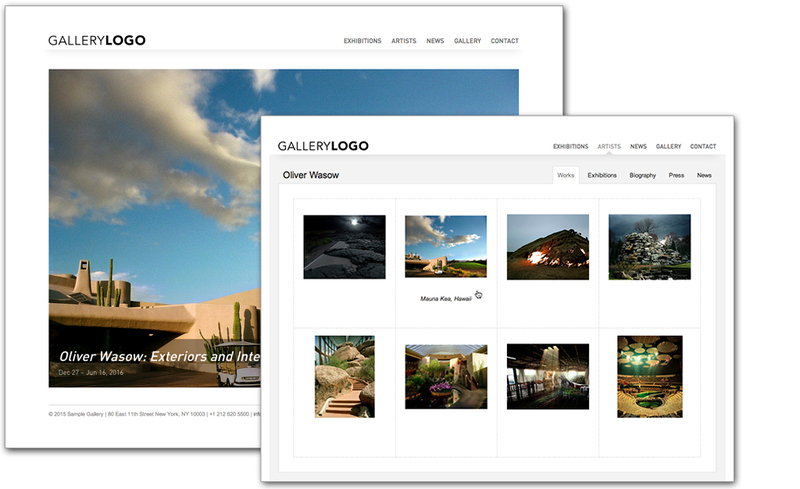 Template websites include pages for Home, Artists, Exhibitions, News, Gallery, and Contact. Works pages include detail and large views, thumbnail grid, image carousel, multiple images, and print views — plus works slideshow. Pre-configured pages and features can be added for low set fees (see 'Content Options' at right). Sites also include Artist, Gallery, and Exhibition details, News Items, and Artist Press. All three template themes, Standard, Touchstone, and Criterion, plus the Artist Website template (Touchstone theme) can be fully customized for features, pages, and design. 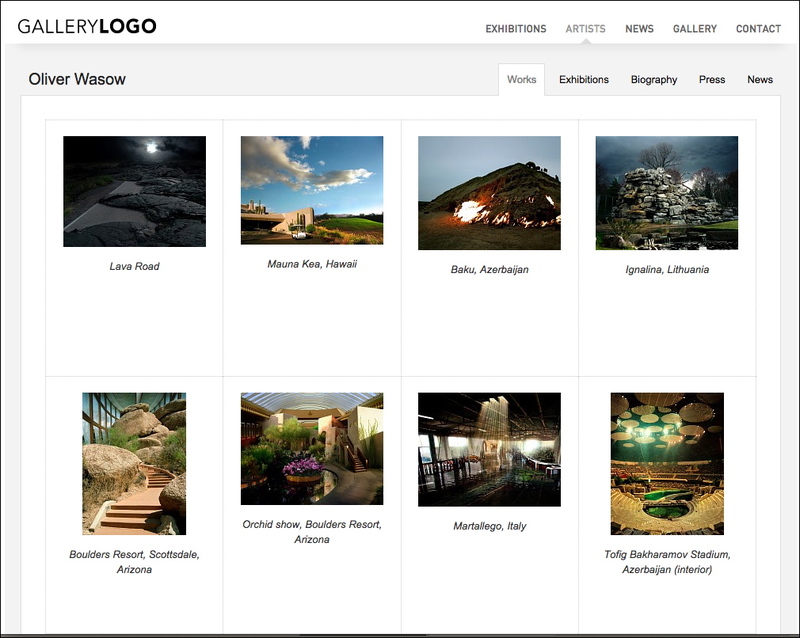 Artsystems also offers additional pre-set and custom website options to its templates such as for dedicated Gallery Press, Art Fairs, and Publications pages, each with its own automated content management features. An unlimited Private Room section is also available, as is Keyword and Advanced Search. See our Standard Theme with Options, Touchstone Theme with Options, and Criterion Theme with Options sample sites for examples of these options. Each option is available for a low set fee. 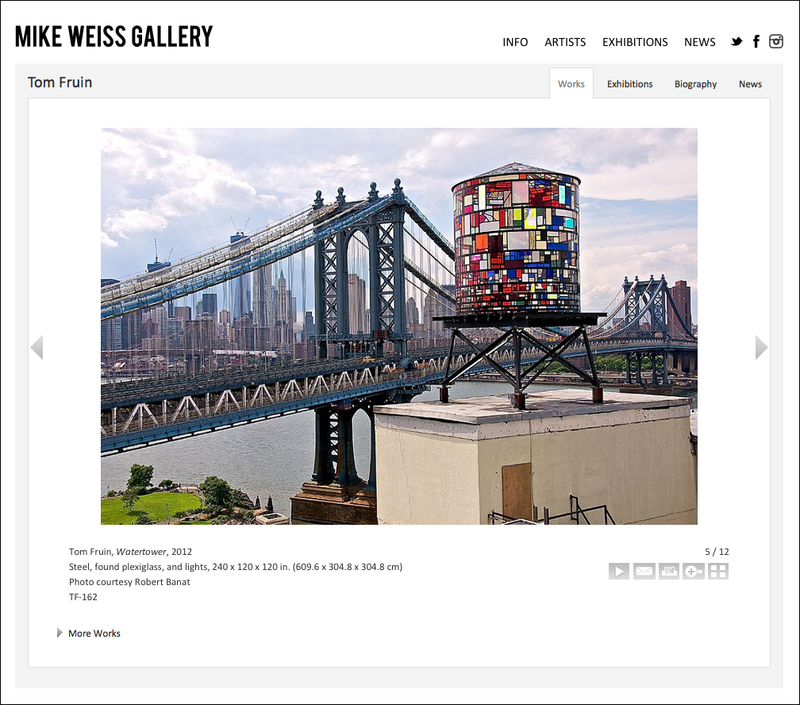 For an inexpensive streamlined (not customizable) private website for collectors, see our Collector Website template. Our developers can create a custom website design for one of our standard responsive-design template themes or create a completely customized site. Artsystems will be happy to recreate or re-design your current site and integrate with our Pro Website CMS for automatic site content renewal. We can work with your designer, or create a newly-designed site for you ourselves. The online CMS for the Pro Website, a thorough and easy-to-use online content management system, uploads, updates, and manages all website content. Besides bulk uploading work details and images, including exhibitions in minutes, the CMS is configured to add content to all site pages easily, including supporting PDFs and links. The CMS includes both a 'staging' and 'production' level, allowing for a site-wide review of changes in advance of publishing. 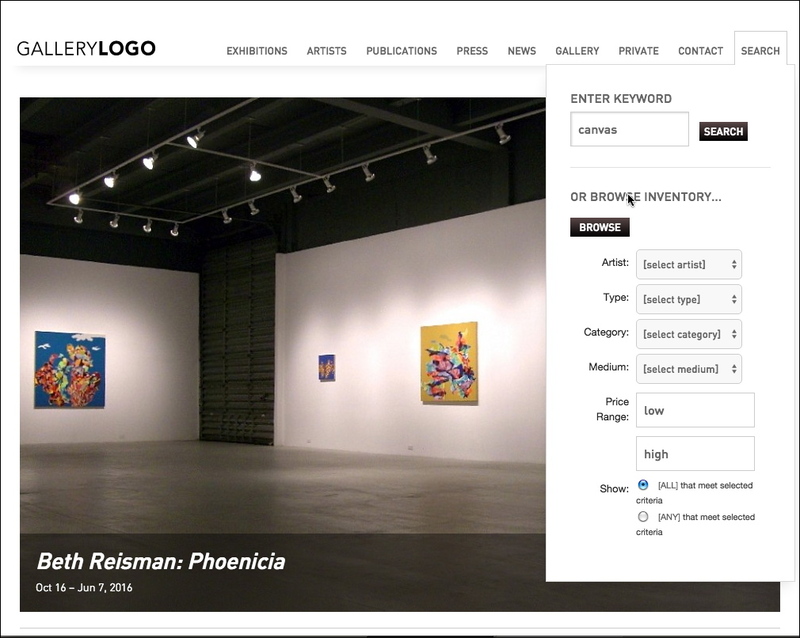 The Pro Website online content management system (CMS) includes a compatible import tool for works from any art gallery software that is able to export to Excel or to a text file. 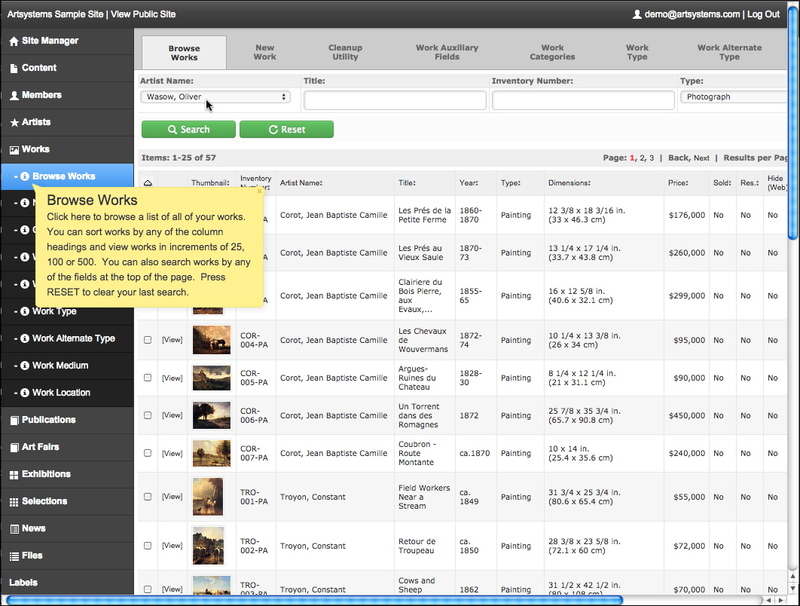 In mere minutes, entire exhibitions or groups of works can be posted to an Artsystems website. 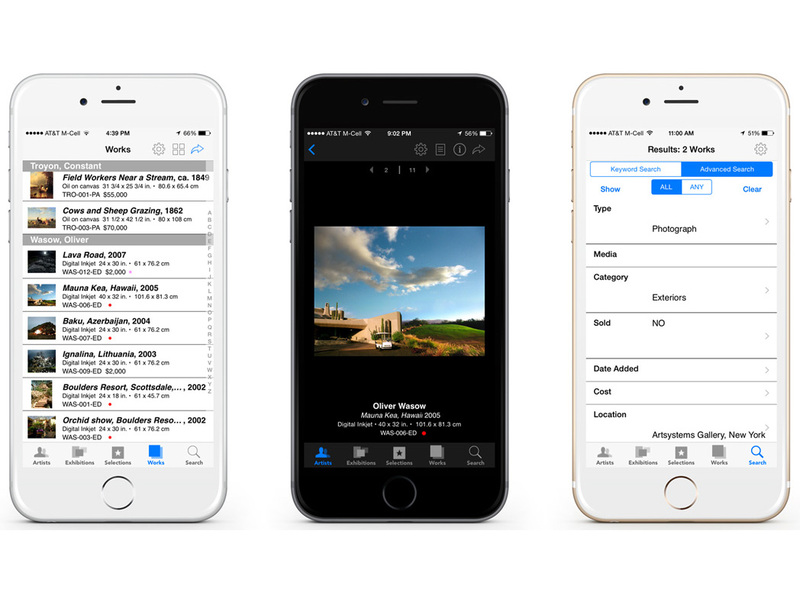 Soon, our Pro database software will load artwork and exhibition details directly into to the Pro Website content management system, without the exporting/importing of an Excel file. In Pro, users will mark works to be live both on a website and/or in the ProFile app, allowing posting on one venue and not the other, and displaying the online status of all published works. Additionally, both the website and app will post updated sales status and notes back to the CMS, to be sent back automatically to the Pro database. The Artsystems online content management system (CMS) is shared both by a Pro Website and the ProFile iPad/iPhone app. This unified interface allows works and exhibitions to be posted just one time for both venues simultaneously. Individual works, groups, or exhibitions can be marked not to display on one venue, the other, or both. 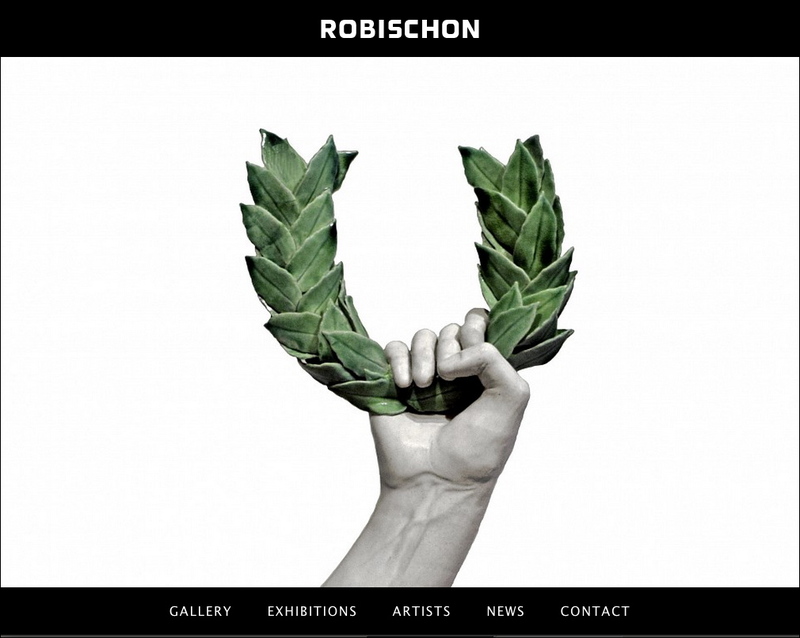 Artsystems has created self-administered websites for over 150 art and antiques galleries, private and corporate collections, artists, artists estates, and catalogues raisonnés. Beginning in 2015, new sites have been mobile-friendly responsive-design sites. Examples of latest projects include websites for Oliver Wasow, Gitterman Gallery, Lee Marks Fine Art, Robischon Gallery, Janet Rady Fine Art, Galerie D'Este, and Edward Cella Fine Art.